Join Scuba.com on Thursday, October 18 at 6pm, for a chance to win prizes in our costume contest and learn to face your fears at this inspirational event! IRVINE, CA, UNITED STATES, October 13, 2018 /EINPresswire.com/ — Halloween is here! 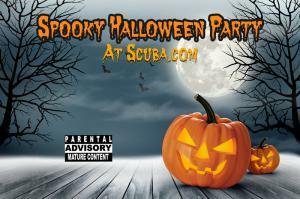 Join us at Scuba.com, Thursday, October 18 at 6pm for a chance to win prizes in our costume contest and learn to face your fears at this inspirational event! Come hear gruesome stories from a professional search-and-recovery diver with the sheriff’s department who has been recovering dead bodies for over 25 years. Despite working a grim job, he still recreationally dives every chance he gets. Hear the story of Maria Korcsmaros, shark attack survivor turned shark advocate. Two years ago she had a frightful encounter with a massive predator of the sea. This took her on a journey to learn as much as possible about these magnificent creatures and how to protect and conserve them for the sake of the ocean’s ecosystem—the other 70% of the earth. So join us this Thursday, October 18 from 6pm to 8pm. Let’s spend less time being afraid and more time living!